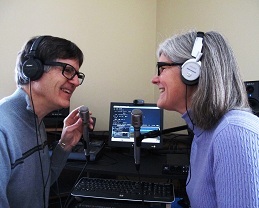 This half-hour weekly radio program and podcast discusses products, services and daily living tips for people with vision loss. It is available through radio reading services across the US and Canada, via 3 internet streaming services, and to everybody else as a podcast. To date, the show has been downloaded in all 50 states in the US and over 100 other countries on all the inhabited continents. Eyes On Success is hosted and produced by Peter Torpey and Nancy Goodman Torpey and distributed by WXXI Reachout Radio in Rochester, NY through the International Association of Audio Information Services (IAAIS). Each episode is basically a success story. Some are human stories of visually impaired people's accomplishments in academics, employment, sports or pasttimes. Others are descriptions of adaptive aids that enable visually impaired people to achieve things. These include screen readers, magnifiers, navigation aids, and others. In all cases, the focus is on success. 2011 WXXI’s Producers Award in honor of creating and hosting the weekly radio series heard on Reachout Radio, WXXI’s reading radio service. 2012 Program of the Year Award in the Consumer Information category from the International Association of Audio Information Services (IAAIS) for show #1242 about Downloading and Reading Books on a Smart Phone. 2015 AFB's VisionAware named Eyes On Success "Agency of the Month" in recognition of the amount and quality of information provided to people with vision loss. This was the first time that this award was given to an organization that was not actually an agency. 2016 Program of the Year Award in the Interview category from the International Association of Audio Information Services (IAAIS) for show #1644 about Currency Identification. 2017 Program of the Year Award in the Interview category from the International Association of Audio Information Services (IAAIS) for show #1725 about Low Vision Optometry. You can play Eyes On Success with Amazon or Google smart home devices by saying "Play Eyes On Success podcast". Click here to find out how you can support Eyes On Success. Click here for a list of resources for the visually impaired. Click here for accessibility tools that Pete developed. The logo is a black square with rounded corners and has the letters EOS in silver across the top with 4 silver lines fanning out downwards from the bottom of the O. Since the initials of the show's name (Eyes On Success) spell the name of the Greek goddess of the dawn (EOS), the logo was designed to give the impression of a sunrise which in turn provides a positive uplifting feeling in keeping with the theme of the show. We are grateful to our daughter Allison for the graphic design work. The Torpey's both have PhD's in Physics and retired from Xerox Corporation after over 25 years in corporate research. 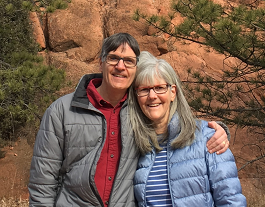 Nancy is sighted and Pete is blind, and they've been learning together for many years. 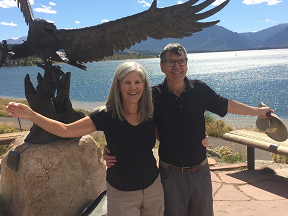 Pete and Nancy have two adult children, 2 young grandsons and they love to travel, hike and enjoy music together. Here are photos of them at Garden of the Gods, at Lake Dillon and in their home studio recording Eyes On Success.